River Valley junior Rory Twyman (3) attempts to drive toward the basket against an Alexander defender during Friday night’s boys varsity basketball contest in Bidwell, Ohio. BIDWELL, Ohio — The first half was the deciding factor. 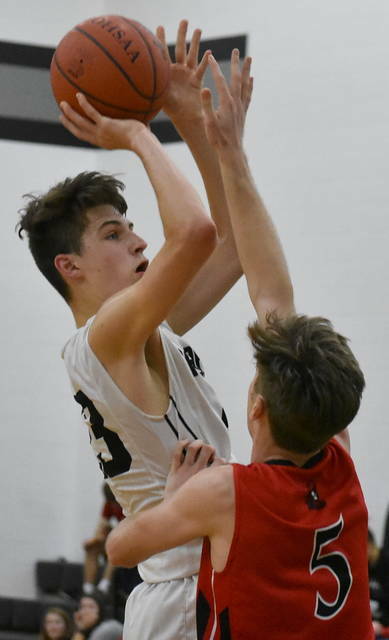 The River Valley boys basketball team trailed visiting Alexander by 21 points at intermission on Friday night in a contest between Tri-Valley Conference Ohio Division foes in Gallia County. 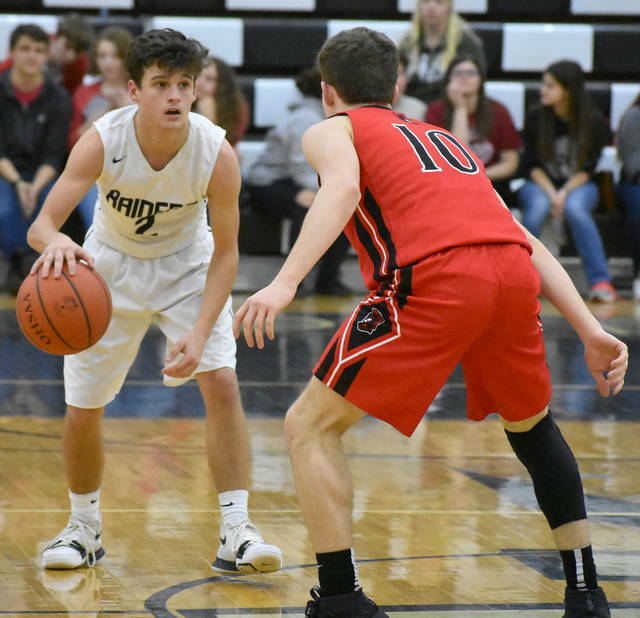 The Spartans (8-5, 6-2 TVC Ohio) began the night on an 11-2 run — as they held the Raiders (4-12, 2-7) for over a span of 6:02 of the first quarter — en route to a 57-36 victory. RVHS was held to eight points in the first half as AHS surged to a 29-8 lead at halftime. The Spartans led 16-4 after eight minutes of play. The Silver and Black struggled from the field before the break, as they made 3-of-23 shot attempts, including a 0-of-4 performance from beyond the arc. Alexander built its advantage by making 11-of-33 shot attempts, including 3-of-11 from long range. Both teams minimized turnovers through the first two quarters, as RVHS committed eight and AHS had two. 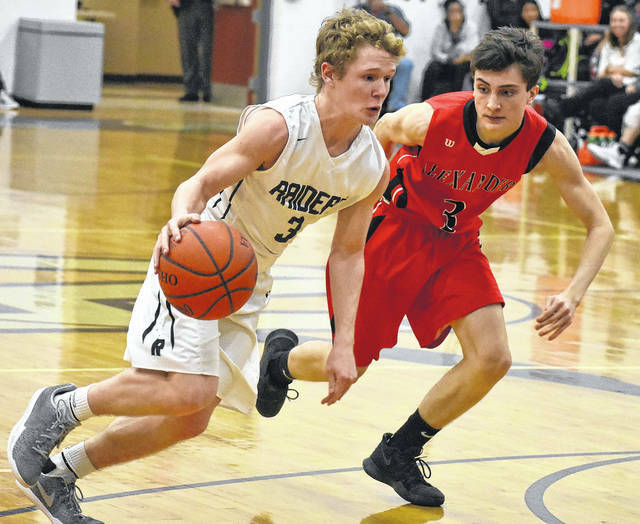 Alexander held a decisive advantage in rebounds at the midway point, outrebounding River Valley 23-13. The Red and Black outscored the Raiders by a 15-13 clip in the third frame, but the visitors still held a sizable 44-21 lead heading to the final quarter. RVHS closed the fourth period with a 15-13 run, as the Spartans held on to earn a 21-point road victory. The win served as a season sweep for Alexander over the Silver and Black, having prevailed on Dec. 19, 2017, by a final of 58-49 in Albany. The Raiders made 12-of-51 of their field goal attempts, including 2-0f-10 from three-point range. RVHS also went 10-of-16 from the charity stripe for 62 percent. The Silver and Black collected 32 rebounds and committed 19 turnovers. Dustin Barber led the way for River Valley with 11 points. Jarret McCarley followed with nine markers, while Jordan Lambert chipped in seven markers. Matthew Mollohan was next with six points, while Brandon Call concluded the scoring for RVHS with three markers. The Spartans made 31-of-54 shots from the field, including a 6-of-19 effort from beyond the arc. AHS also went 9-of-15 from the line for 60 percent. Alexander crashed the boards for 35 total rebounds and committed just seven turnovers. Nine different Spartans reached the scoring column in the contest, as Caleb Terry led his team with 11 markers. J.K. Kearns followed with nine points, while Dylan Mecum and Kam Riley had eight markers apiece. Tyler Rice was next with six points and Ryan Davidson finished with five markers. Luke Kish and Matt Brown chipped in four points each, while Stone Markins-Erwin rounded out the scoring for AHS with two points. The Raiders return to action on Tuesday as they travel to Oak Hill to face the Oaks at approximately 7 p.m.